Astrid Lindgren was a Swedish Author, born in 1907 and most popularly known for her stories of Pippi Longstocking, a character she had invented whilst taking care of her daughter, who was very unwell at the time. Have you read any of her books? I read the Pippi Longstocking stories as a child and am currently reading “Mio, min Mio” (English title: Mio, My Son) and Madicken. The thing that I love most about these stories, is their simplicity. Lindgren takes simple childhood activities and turns them into great adventures. Mio min mio is the story of a young boy who is being looked after by a horrible elderly couple. One day, a genie takes him to a land far, far away, where he finds his real father, the king. However, beyond this far away land is another place, where an evil knight resides. This knight has been stealing children and it is Mio’s destiny to fight him. Lindgren builds a beautiful world in the telling of this tale. It is both sad and moving but also fills the reader with hope. The storyline might sound like a typical ‘kid gets adopted by awful people, escapes and finds his real father, who happens to be a hero” but Lindgren brings so much more to the story than that. All of her stories can be found in English translation and I recommend them whole-heartedly, not only for children, but for adults too! Astrid Lindgren truly did create that “enchanted place where you can go and find the rarest kind of joy”. Just look at her, she was so very sweet! I’d love her to be my grandmother! Did you know that an asteroid that was discovered in 1978 was named after Astrid Lindgren? It is called the 3204 Lindgren and after it was named, Astrid Lindgren joked, “From now on you can address me Asteroid Lindgren!” Adorable! hello darling thanks for your comment! you too post lovely things! 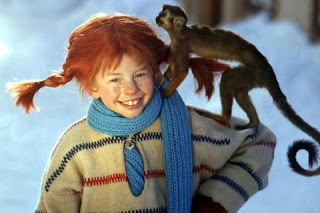 i love pippi, when i was a child i've seen the whole tv episodes! You're welcome! Thank you for your sweet comment :) Have a lovely Nordic day too Amy! Oh I love her face and I feel I would love her stories. Hi, very nice to meet you Nikki. I thought the font was small but I could read it easy and clear. I'm glad to hear that, I'm trying to get it a little bigger but I'm struggling with the format a little. But I'm glad it's clear and easy to read, anyways. OMG, I loved those books so much as a kid. Glad I found your blog-- I enjoy Scandinavian culture as well. Love this post!!! I didn't know all that about "Asteroid" Lindgren. She sounds like she was a wonderful woman. Glad I found your blog, and thanks for stopping by mine! Very cool! I've only read the Pippi Longstocking series, when I was a child. Good luck to you too. I'm coming to visit you now! Aww! I get that sometimes too. Thank you for your sweet post, since your into fairytales and children's literature, I really recommend reading her work, I think you'd love it! LOVED Pippi as a child. I loved this reminder. I love that your into Scandinavian things. Do you live there? I've been to Sweden and Finland and absolutely loved them both! Here's my first post for the challenge! Hi, I LOVED Pippi Longstocking as a kid. She was the most independent character with great pluck. So interesting to hear more about the author, to see a photo of her. I'll have to read more of her work! You should :) I loved her too, she was a great character. Thank you for your comment! Nikki, thank you for stopping by my blog and for your kind comment. Thank you very much! I know what you mean, elderly people should be portrayed as sweet and gentle but there are often evil great auties or wicked old witches! Watch out for them! Loved Pippi Longstocking when I was growing up! 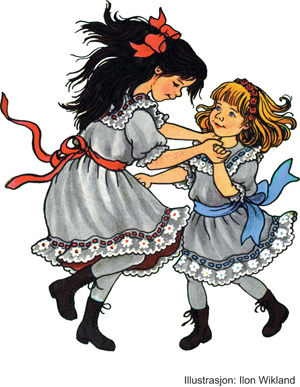 I'm so so happy that I found your blog :) 1st because you'll be blogging about nordic stuff and 2nd because I love Astrid Lindgren. I've grown up with Karlsson, Pippi, and Ronja. Actually, lately I was thinking to reread them, but this time in english or danish (my native language is bulgarian). Hi, thank you for your wonderful comment! 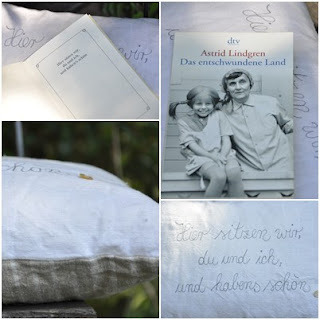 I'm glad to hear that you are a fan of Astrid Lindgren :) I will be visiting you in a second! :-) Nice to "meet" you! Great idea for a Nordic theme. looking forward to reading more from you. I loved Pippi Longstocking as a kid. Good luck with the challenge. Wow! Pippi Longstocking! I remember her - didn't she sleep with her head under the covers and her feet on the pillow or something? I like that quote! I don't know what I would do without books. With my red hair I often am Pipi Longstocking for Halloween. It's great that here in Louisiana kids still know who she is. Technology is nice, but when the electricity is out you can still turn on a book. Great post. That's so sweet, I kind of long for red hair, it's very pretty. I hadn't realised how popular/well known she is, it's lovely to hear! I like the way you say "you can still turn on a book", that's a lovely thought :) Thank you for your kind comment! She looks adorable. I would like her to be my grandmother as well although both my grandmothers were adorable as well. Hi Nikki, thanks for visiting my blog. I'm fascinated to see what your Nordic themed posts will be about :). This A to Z Challenge is going to be fun and have already learned something new. 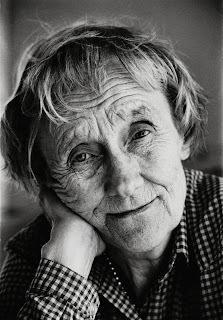 Never heard of Astrid Lindgren, but thanks to your blog we now know a little about her. This A to Z Challenge is going to be so much fun and we look forward to reading much more. Thank you for visiting our blog and commenting. We look forward to reading all about your Nordic Theme, hope you continue to follow our Full Time RV Travel Theme. I'm pleased to hear that you learned something. I was happy to have found your blog and will definitely be following you! Aww :) Thank you for your comment! Great blog and post! I'll be sure to be checking back some more (as I, too, really like Scandinavian culture). Hi Nikki - wouldn't mind *slightly* bigger font on your page. Nice to hear all about Astrid - I mean, Asteroid - Lundgren. Lovely blog, by the way! I'll be looking forward to your upcoming posts. Thank you very much :) I'll look out for that one, since I'm not sure I've read the entire collection! I was introduced to Pippi Longstocking by my third grade teacher. Every afternoon she read to us while we rested. Pippi was a favorite of mine. What a cool blog! I am part Norwegian. In fact, I still have relatives in Iceland. Very interesting stuff! I'm looking forward to reading more posts. Thank you for your comment, I'm jealous of you having Icelandic relatives, have you ever been there? This was fascinating! I'll have to find those books for my girls. I think they would enjoy them. I definitely recommend them, all of Lindgren's stories are so lovely in my opinion! I loved the Pippi Longstocking stories as a child and still as an adult. They were delightful! Thank you for this wonderful reminder of such a wonderful author and her writings! this is a most fascinating post! i love pippi! and, i follow your blog now as well...off to look at your B post about botanical gardens, another of my favorites! It is a real art to write well for children. Thanks for joining my blog! Interesting blog you have here! Cheers! I love that quote, and I used to read Pippi Longstocking! I save that quote; wonderful! Love Pippi Longstocking! Ooh, what a wonderful idea for an A-Z theme. I love Lindgren's Pippi Longstocking books; I should make it a point to read more of her stories. I hadn't known about that asteroid, what a neat thing!